"For What It's Worth" is a song written by Stephen Stills. It was performed by Buffalo Springfield, recorded on December 5, 1966, and released as a single in January 1967; it was later added to the re-release of their first album, Buffalo Springfield. The single peaked at number seven on the Billboard Hot 100 chart. This song is currently ranked #63 on Rolling Stone's list of The 500 Greatest Songs of All Time as well as the eighth best song of 1967 by Acclaimed Music. Although "For What It's Worth" is often mistaken as an anti-war song, Stephen Stills was inspired to write the track because of the Sunset Strip curfew riots in November 1966. The trouble, which started during the early stages of the counterculture era, was in the same year Buffalo Springfield had become the house band at the Whisky a Go Go on the Sunset Strip in Los Angeles. It was within this period that local residents and businesses had become increasingly annoyed by late-night traffic congestion caused by crowds of young people going to clubs and music venues along the Strip. In response they lobbied the city to pass local ordinances that stopped loitering and enforced a strict curfew on the Strip after 10pm. However young music fans felt the new laws were an infringement of their civil rights. On Saturday, November 12, 1966, fliers were distributed on Sunset Strip inviting people to join demonstrations later that day. Several of Los Angeles' rock radio stations also announced that a rally would be held outside the Pandora's Box club on the corner of Sunset Boulevard and Crescent Heights. That evening as many as 1,000 young demonstrators, including celebrities like Jack Nicholson and Peter Fonda (who was handcuffed by police), gathered to protest against the enforcement of the curfew laws. Although the rallies began peacefully, trouble eventually broke out among the protesters and police. The unrest continued the next night and periodically throughout the rest of November and December forcing some clubs to shut down within weeks. Against the background of these civil disturbances, Stills recorded the song on December 5, 1966. The song quickly became a well-known protest song. The song's title appears nowhere in its lyrics; it is more easily remembered by the first line of chorus: "Stop, children, what's that sound?" Stills said in an interview that the name of the song came about when he presented it to the record company executive Ahmet Ertegun who signed Buffalo Springfield to the Atlantic Records-owned ATCO label. He said: "I have this song here, for what it's worth, if you want it." Another producer, Charlie Greene, claims that Stills first said the above sentence to him, but credits Ahmet Ertegun with subtitling the single "Stop, Hey What's That Sound" so that the song would be more easily recognized. In 2006, when interviewed on Tom Kent's radio show Into the '70s, Stephen Stills pointed out that many people think "For What It's Worth" is about the Kent State Shootings (1970), even though the song predates that event by over three years. Neil Young, Stills' bandmate in both Buffalo Springfield and Crosby, Stills, Nash & Young, would later write "Ohio", in response to the events at Kent State. The song was played (without Neil Young's presence) at Buffalo Springfield's induction to the Rock and Roll Hall of Fame. "For What It's Worth" has been covered, sampled, and referenced in numerous musical performances. The most well known are by Cher, The Staple Singers, The Muppet Show, and Public Enemy. Cher's 1969 cover did not enter the Billboard Hot 100, but received decent reviews, with Allmusic retrospectively calling her version "mature [and] forceful." Public Enemy sampled "For What It's Worth", for their 1998 song "He Got Game," which also featured Stephen Stills. The Staple Singers covered "For What It's Worth" in 1967 on the Epic Records label. A low key yoga version of "For What It's Worth" was done by DJ Drez in his album Jahta Beat: The Lotus Memoirs, with riffs and main lyrics adapted from this song. Oui 3 adapted the song for their 1993 debut single of the same name, which reached number 26 in the UK chart. Sergio Mendes & Brasil '66 covered the song on their 1970 album Stillness. The track featured lead vocals by Karen Phillip. Canadian progressive rock band Rush included their version of this song on their 2004 EP Feedback. American Idol runner-up Crystal Bowersox recorded a version and released it on her 2010 CD Farmer's Daughter. The song has also been covered by Kid Rock in 2013, in 2005 by Ozzy Osbourne on his album Under Cover, and by Queensryche on the album Take Cover. Oxfordshire band The Candyskins covered the song on their debut album, Space I'm In, on Geffen records; it was released as a single. Ann Wilson of Heart covered the song for her 2015 solo EP titled The Ann Wilson Thing! #1. Orchestral band Think Up Anger produced a slower, more emotional cover of the song, however it only includes the first verse and the chorus. This cover appeared in advertisements for the 2016 film Lights Out. Meat Loaf covered the song in 2016 on the Target exclusive deluxe release of the album Braver Than We Are. The Muppet Show episode 221 partly rewrote the song to be an anti-hunting song. The song is performed by forest animal Muppets, who are periodically interrupted by rampaging human game hunter Muppets. Nathan Morris of Boyz II Men, in "Wishes" on the Kazaam soundtrack. tobyMac, in "What's Going Down" on Momentum. Although Buffalo Springfield member Neil Young never allows his work to be used for commercials, he did not write this song. He has publicly criticised those who do use the song commercially, however, in his song "This Note's for You." ↑ Unterberger, Richie. "Great Moments in Folk Rock: Lists of Author Favorites". Richieunterberger.com. Retrieved 2011-01-26. ↑ Jim DeRogatis (1996). Kaleidoscope Eyes: Psychedelic Rock from the '60s to the '90s. Carol Publishing Group. p. 51. ISBN 978-0-8065-1788-9. Retrieved 13 October 2015. ↑ "Acclaimed Music Top 3000 songs". Acclaimed Music. 27 May 2009. ↑ Gilliland, John (1969). "Show 34 – Revolt of the Fat Angel: American musicians respond to the British invaders. [Part 2] : UNT Digital Library" (audio). Pop Chronicles. Digital.library.unt.edu. 1 2 3 "Sunset Strip Riots | Closing of club ignited the 'Sunset Strip riots'". Los Angeles Times. 2007-08-05. Retrieved 2012-01-16. ↑ Lustig, Jay (18 February 2011). "Song of the Day: 'Rock 'n' Roll Woman,' Buffalo Springfield". The Star-Ledger. Retrieved 19 February 2011. ↑ Einarson, John; Furay, Richie (2004). 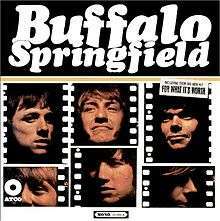 For What It's Worth: The Story of Buffalo Springfield. Taylor Trade Publications. p. 127. ISBN 978-0-8154-1281-6. ↑ Stevenson, Tommy (20 October 2010). "'Days of Rage' conference revisits unrest of May 1970". Tuscaloosa News. Retrieved 19 February 2011. ↑ "CSN, Jackson 5 Join Rock and Roll Hall of Fame". Rolling Stone. 8 May 1997. Retrieved 19 February 2011. ↑ Mark Deming. "3614 Jackson Highway - Cher | Songs, Reviews, Credits". AllMusic. Retrieved 2016-09-30. ↑ Locker, Melissa (2012-11-05). ""He Got Game" | Public Enemy at 25 | TIME.com". Entertainment.time.com. Retrieved 2016-09-30. ↑ "Oui 3". Blair Booth Music. Retrieved 6 April 2016. ↑ "Oui 3". Official Charts. Retrieved 6 April 2016. ↑ Kurp, Josh. "Ten Skits That Prove 'The Muppet Show' Was For Adults More Than Kids". Warming Glow. Retrieved 30 October 2013. ↑ "Chinese Man - 10 Years Mix by High Ku". YouTube. 2014-10-07. Retrieved 2016-09-30.